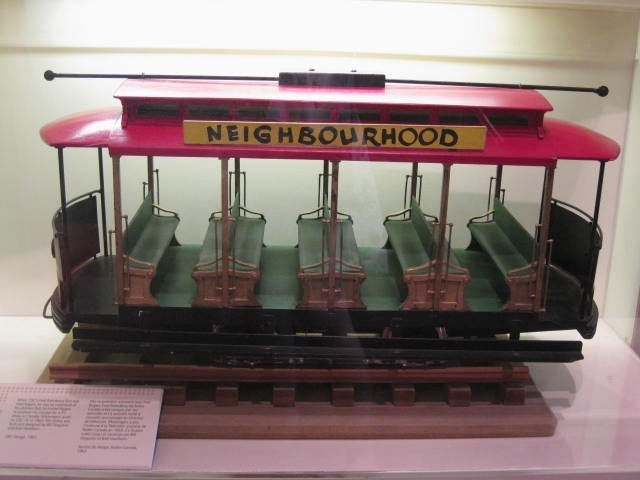 Here's that trolley, which is currently on display. isn't that the one from the Canadian broadcast? and isn't it unfortunate that all his trolley's that were famous end up behind glass? That is the Canadian Trolley from the Misterogers show in Canada. And I think the one you were remembering was from Creative Person when Fred first brought the show to America, right? It's interesting to me that in the "first episode" of what we know now as Mister Rogers' Neighborhood, Mister Rogers notes that things have moved around a bit in his house, and in the Neighborhood... it is specifically said that Lady Elaine moved the Eiffel Tower, for example. Am I correct in understanding there were quite a few episodes between the time of the CBC show and the "national" Misterogers' Neighborhood series? Do any of those episodes still exist anywhere, even in the Fred Rogers Company's archives?